In August 29, 2012, a strong typhoon named Bolaven hit Russia and caused disruptions to train system, power cut-off to thousands of people and also a weather phenomenon called ‘fish rain’. 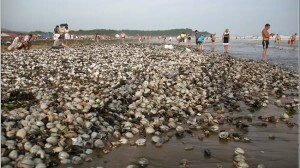 After bringing devastation to the Korean peninsula, the powerful typhoon dominated east Russia for several days with reports that fishes and sea shells rained in Lazurnaya Bay. 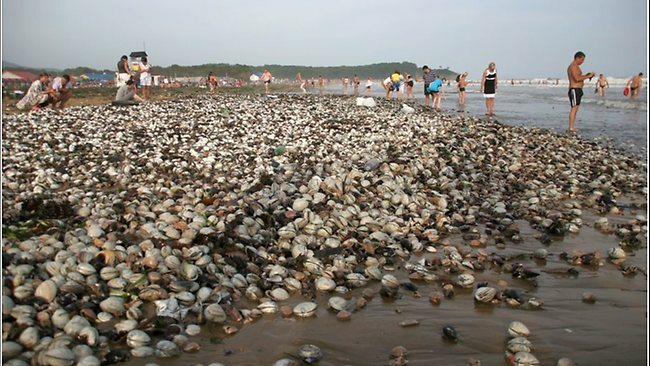 The bay, described to have clean water with a long sandy shore, became a seafood beach after the storm. The raining of fishes, oysters, and crabs became a feast for the residents including restaurant owners. The locals enjoyed the free seafood buffet and even called it as ‘manna from heaven’. For centuries the ‘fish rain’ phenomenon has been happening. According to Weather Scientists, the occurrence of an updraft or vertical movement of air can pick up fish and other contents of the water and bring them up to as high as 60,000-70,000 feet before they fall to the ground. This is a weather-related phenomenon caused by warm or cool air movements in a certain area. Powerful whirlwinds and waterspout can also cause ‘fish rain’.